well hello my beautiful readers(: i just have to say that you all mean the world to me because without you i wouldn't be where i am today! eeppp, so is anyone else loving this daylight saving thing?? i just love that it doesn't get dark til like 7PM...it totally postpones the night time sleepies! ahh, so i'm back in school right now and i feel reenergized and ready to conquer these last couple weeks of the semester...which thankfully is a 180 to how i felt before spring break. and yes, since i'm so excited for the summer, i just loved wearing this look because...well it reminded me of the warm summer sun! yyayy, and i don't know if you've noticed that i've been definitely into the whole urban look...i mean my mom says it's 'grunge' and my guy says i'm dressing like a 'seattle hippie'...oh those two just give me the giggles(: let me know what you think? i love hearing all your feedback, it totally keeps me going! have a darling rest of the week! you look so adorable! i love this look. I love this outfit! It's soo perfect. I wouldn't have even thought to mix those pieces together! They all just work so well together. Also, your hair is sooo gorgeous! I'm like the biggest fan of red hair, but it would look horrible on me, so I can't dye it :( Anyway love your style! your hair is fantastic & headband totally complements it! 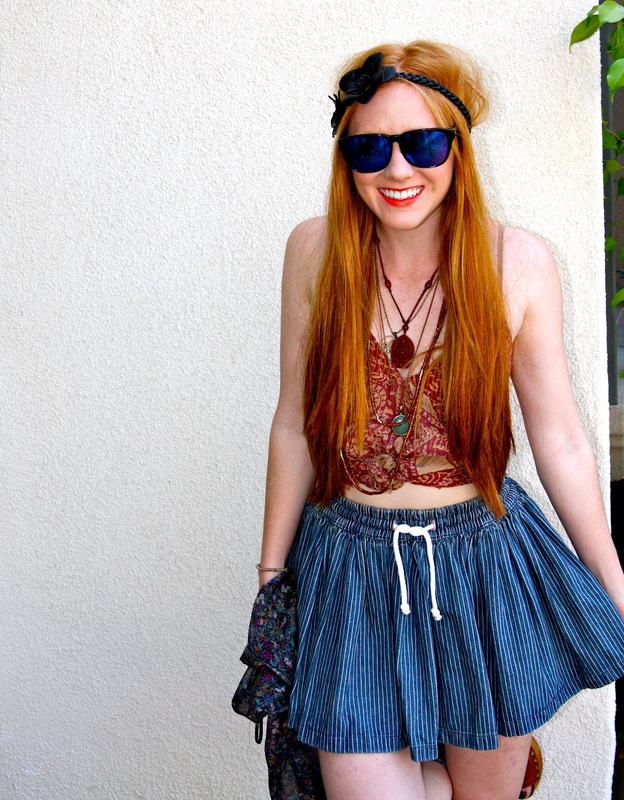 i like this look - it's a little hippie and a little grunge, you're doing your own thing! this is such a great boho look!! so perfect for summer and Coachella!! Uggggggggg I want your hair soooo bad! It look so beautiful! LOVE this post! Have a great week dear and stop by my blog when you get a chance! yes¡¡¡¡ you have given it a hippie touch! Your hair is gorgeous! Hair band SO cute. Brilliant outfit everything goes well together! Daylight savings is the best! For me, it doesn't get dark until after 8 pm for me! Btw, I'm in love with your outfit! The skirt is so flowy and goes with your top so perfectly! i think it's very boho chic, and i love it. super cute skirt!!! Love your style! OOOOOOH and that hair. Please can we swap hair? Haha I wish! incredible glasses, and i love the pictures of you cracking up! :) cutie gal! You look so cute with you outfit! We love it! 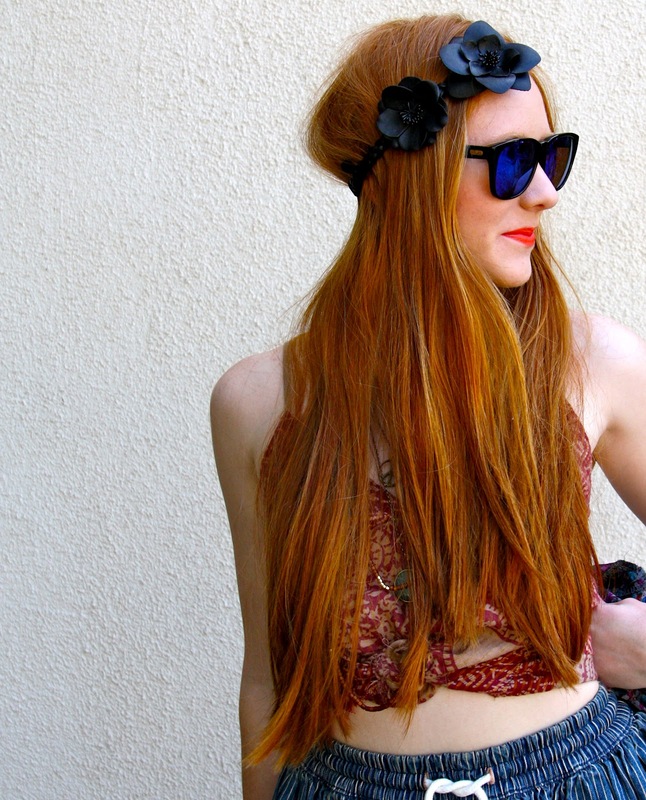 I´m falling in love with your blog and your whole style!!! Love it! Please have a look at my blog! maybe we can follow? you look soo lovely when you smile! You make me crave for Summer SO much! Cute look! Love that skirt! man you are too cute! what a fun photos! i love this crop top. it makes me swoon!